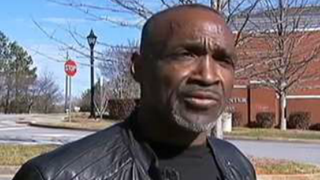 John Blue, of Georgia, says he wants justice after he spent seven months in jail on an assault charge of which he was eventually found not guilty, WSB-TV reports. Blue was charged with aggravated assault last summer for allegedly ramming his van into a state welfare worker’s vehicle. Blue, his girlfriend and his sons, who were all at the scene of the incident, told police that Blue had not attacked the worker with his van and that instead, it was the welfare worker who attacked Blue. “She crashed my car. She rammed my car,” Blue said he told police. Blue said he lost his apartment, his job and his interior-design shop while he was imprisoned for seven months awaiting trail. As a result, Blue thinks that the state welfare worker needs to be brought up on assault charges, since he was cleared of any wrongdoing. No one from the Duluth, Ga., Police Department or the Department of Family and Children’s Services—where the state welfare worker works—responded to inquiries made by WSB-TV.